It’s hard to believe that a fight this bad could erupt when the only thing she asked for was some maple syrup for her pancakes. A mass brawl ensued when one girl asked another table if they could have some syrup, and got the response: ‘B****, your pancakes look fine to me’. 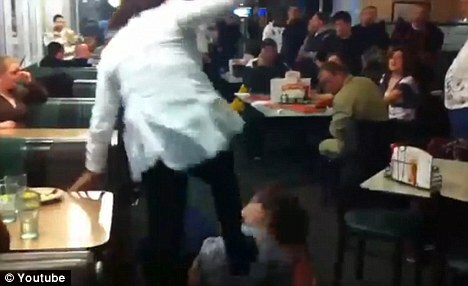 The fight started in a Denny's restaurant in Chicopee, Massachusetts, when one group of girls did not have enough maple syrup. while one of them approaches a filming camera and says ‘YouTube it'. pushed over to the ground and her black underwear is partially exposed. over by the same girl who started punching the first victim. break up the fight before sending out one of the girls. Since the video went viral, police have said the brawl started following an argument that allegedly stemmed from a traffic incident in the car park outside the restaurant. Captain Steven Muise told The Republican that the fight began after one man punched another in the head. The men were accompanied by the three women in the video. 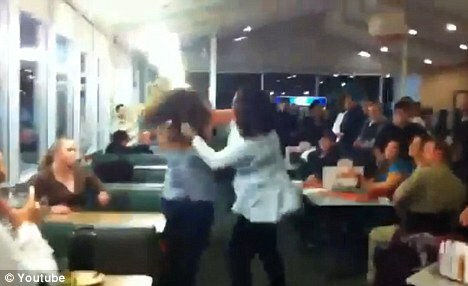 The incident comes just one month after two other videos of female brawls were posted on YouTube. Pancakes restaurant in Orangeburg in January.